Part of the preservation ethic is trying to guarantee that all shipwrecks stay in the public domain. One way of doing that is to place shipwrecks that have historic significance on the National Register of Historic Places. Being on the National Register does not guarantee that an unscrupulous diver can't remove artifacts from the wrecks, but it does establish public ownership of the shipwreck so no one can make an admiralty claim on a wreck and start removing artifacts to sell on EBay or for a personal collection. It also guarantees that pertinent state law on abandoned property can be enforced. Traditionally in Minnesota the State Historic Preservation Office has contracted professional archeologists to do this task. With the state as always in a budget crunch there were no funds to write the Benjamin Noble nomination. Going through normal government channels, which requires bids, and progress reports, field work, etc. this typically costs $3,000 to $10,000. Getting the nomination process started in a timely manner is critical to establishing ownership of the shipwreck. After the team of shipwreck hunters Jerry Eliason, Randy Beebe, Ken Merryman, and Kraig Smith discovered the Noble, all were interested in protecting and preserving the shipwreck. Working with Scott Anfiinson, Minnesota National Register Archeologist from SHPO and Keith Meverdon, the Wisconsin Underwater Archeologist, the finders and GLSPS forged a plan to raise the money and apply it to getting the Benjamin Noble in its rightful place with other historically significant shipwrecks. The plan, which is now been successfully completed, was to contract Jeremy Nienow, a grad student and intern with the Minnesota SHPO, for $1000 to do the research and write the National Register nomination. The wreck finders provided all site information to Jeremy so there was no need for professional field work, another costly task. Steve Daniel did the site drawing based on the animation model developed by Ken Merryman. Scott Anfinson and now David Mather oversaw the process and worked with Jeremy to make sure the nomination criteria was met. Pat Labadie donated his time to consult on some or the more difficult details of the nomination. 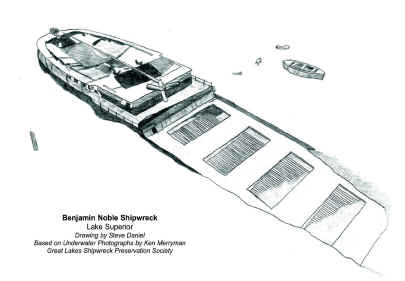 The Lake Superior Magazine made good on their twenty year old reward of $1000 to the finder of the Benjamin Noble. The wreck finders all agreed to pass the money directly to GLSPS to manage the funds, which were applied to the cost of the writing the nomination. GLSPS also managed the execution of the contract. Everyone involved stretched a little to make this happen. On Tuesday May 15, 2007 the nomination was unanimously approved by the Minnesota State Review Board, which is the last step before the nomination goes to the National Review Board for final approval. In November 2007 the National Park Service "Keeper of the Register" listed the Benjamin Noble on the National Register of Historic Places completing this three year project. It is another example of how your organization is taking the right steps to preserve our shipwrecks and do it in a financially responsible way. Our thanks to all involved in the process.